he salinity study of some of the State’s major rivers has revealed that the anthropogenic activities like sewage discharges, port activities, barge/ship building yards, river cruises, sand mining, have added various types of contaminants to the riverine and the coastal environment, threatening them by exerting tremendous pressure on their fragile ecosystem. 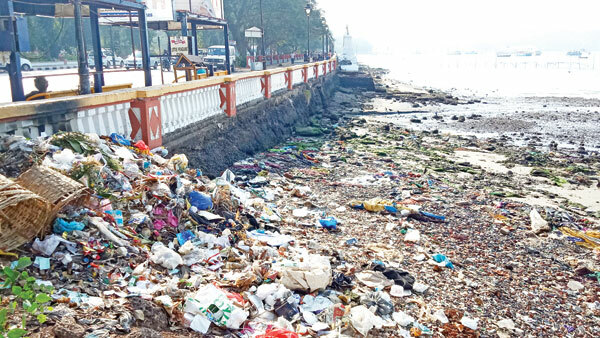 As a part of the Coastal Zone Management Plan (CZMP) exercise, the Department of Environment had asked the Goa State Pollution Control Board (GSPCB) to conduct a special study of salinity content in major rivers of the State. The study conducted to monitor salinity presence up to 5ppt (parts per thousands) shows a distinct decrease in salinity from the estuarine towards the upstream of the estuary. Salinity in the rivers varies sharply over the seasons. It remains low during monsoon and high during non monsoon seasons and so does the physiochemical characteristics of water. The variation also reflects in the physicochemical factor in the wells located along the river bank. The average ocean salinity is 35ppt and for rivers it is 0.5ppt or less. However, in case of Goa, the rivers have salinity presence over 5ppt, which is dangerous for the marine ecosystem. With increasing population, its anthropogenic activities have added various types of contaminants to the riverine and the coastal environment, threatening them by exerting tremendous pressure on their fragile ecosystem. The anthropogenic activities such as sewage discharges, port activities, barge/ship building yards, river cruises, railway embankment, shoreline construction, sand extraction, ore transportation etc. exert and impact the coastal ecosystem. What is river salinity and how it is measured? Salinity is the measure of the amount of dissolved salts in water. It is usually expressed in parts per thousand (ppt) or percentage (%). Freshwater from rivers has a salinity value of 0.5ppt or less. Within the estuary, salinity levels are referred to as oligohaline (0.5-5.0 ppt), mesohaline (5.0-18.0 ppt), or polyhaline (18.0-30.0 ppt). Salinity is often derived from electrical conductivity (EC) measurement. EC is measured by passing an electric current between two metal plates or electrodes in the water sample and measuring how readily current flows between the plates. The use of EC measurements to estimate the ionic content of seawater led to the development of Practical Salinity Scale. The Salinity measurement is done in the month of May 2018 (as i.e driest month of the year) with the portable Salinometer YSI 650 Multiparameter Display System (650 MDS) mandated in the CRZ Notification 2011. The Tiracol River runs about 27 km in length covering approximately 349 hectares of water area in Goa territory. Salinity influences in this river was seen 20 km from river mouth. The mangrove vegetation of this estuary covers approximately 12.89 % of the total water area of the river. The river is one amongst those eleven river stretches which are categorized as polluted by the Central Pollution Control Board (CPCB). The river is known for legal and illegal sand extraction activities. Salinity points: At Sakrali Torshem, Ganapati Visarjan Point the salinity measured is 22.72 ppt. Further at Banda (Maharashtra) upstream of the river at Sherle the salinity measured is 17.13 ppt. Hence, 5.0 ppt could not be traceable in Terekhol River. Hence, the salinity of the entire Terekhol River flowing within the state of Goa is higher than 5.00 ppt. Considered as the lifeline of South Goa, the river is spread across a total length of 64kms. It flows in the southern-western direction through talukas of Sanguem, Quepem, Salcete, Ponda, Tiswadi and Mormugao. Zuari is a negative estuary with more freshwater influx. River Zuari is having 3 tributaries. One flowing towards Sanvordem village, Xelvona village and another towards Chandor village. The river houses the State’s only port- Mormugao Port and also Goa Shipyard Limited. Along the Cortalim side, the river is a hub for scraps of barges, which are lying idle for past four years owing to closer of the mining industry. Salinity presence: The effect of salinity is marked upto Savordem, which is around 28 km upstream from the Arabian Sea; beyond which fresh water environment results in the absence of mangroves. The salinity of 5.28 ppt is measured at Capxem Jetty, Sanvordem and towards downstream of the river at Panchawadi salinity measured is 10.06 ppt. At Xelvona village upstream of the river near Impalla Distilleries the salinity recorded is 2.25 ppt and at the downstream of the river near Dry Dock, Xelvona the salinity measured is 5.81 ppt. The Chapora River is approximately 30km in length with total water area of about 711 hectares. The river originates from a small village called Hajgoli near Belgaum and then it flows through the Tilari Ghat and enters in the state of Goa. It divides North Goa in two talukas Pernem and Bardez. At the estuary to its south is situated popular Vagator Beach and to the north Morjim village. The mangroves have occupied about 20% of the total water area. Mangrove vegetation appears approximately 1.5 km from the estuary mouth. The river also witnesses large scale sand mining activities. Salinity presence: The salinity influence is observed beyond Colvale village which is 18-20 km from the Arabian Sea. The upstream of the river at Sal Dhumashe near temple, measures salinity of 3.13 ppt and further at downstream at Dhumashe, Sal, Near Chapel Christian Waddo the measured Salinity is 5.25 ppt. River Mandovi, also known as river Mhadei, is the longest river of the State with a total length of 81 kilometers, of which 29km flows in Karnataka and 52 kilometers in Goa. There are five tributaries of Mandovi river- 1) flowing along Moira village, 2) Mapusa River, 3) flows along Nerul village, 4) stretch is towards Khandepar and 5) is towards Ganjem Bridge. The river houses six off shore casinos and several cruise ships. It also has a fishing jetty located. It is one amongst those river stretches identified as the most polluted across the country. Apart from this, its estuaries are identified as sand mining den. Salinity influence: The stretch of the Mandovi at Moira bridge, the salinity recorded is 8.75 ppt. At another stretch at Mapusa River the salinity recorded is 7.64 ppt near Green park hotel and further the downstream of the river salinity measured is 13.78 ppt at Khorjuvem bridge. At Nerul village near Marna-Pilerna panchayat salinity recorded is 31.4 ppt. Towards Khandepar River at Opa the salinity of 5.00 ppt is recorded and at downstream of the river Khandepar below Khandepar bridge the salinity recorded is 9.2 ppt. The salinity measured at Ganjem Bridge Upstream is 5.11 ppt and towards downstream at Ambegal bridge at Ganjem it is 6.73 ppt. The salinity presence in the river is higher than 5.00ppt almost entire stretch. The River Sal opens near Cavelossim. It passes through Margao, Navelim, Dramapur, Chinchinim, Assolna and drains itself into the Arabian Sea at Betul. River Sal is divided into 4 tributaries of which one stretch flowing towards Talaulim village, another at Dramapur, then towards Durga Maidan towards Margao, and the final one flowing towards at Panzorconi. The River today is struggling for its existence owing to severe pollution. Sewage discharge by urban population, cattle washing, solid waste dumping are major issues the River is facing, which are caused due to habitation across the river bank. Salinity points: At upstream of river, at Talaulim village, near Hawai garden, Sinquetim, Navelim salinity measured is 2.29 ppt and as it moves further towards downstream, 4.77 ppt is measured. At second stretch, the upstream of the river at Zakani Bandh, Sirlim salinity measured is 0.06 ppt. Further towards downstream of the river at BellaVista –Sirlim (Dramapur) salinity measured is 8.73 ppt. At third stretch at Durga-Madaan near Cross salinity measured is 5.96 ppt. At fourth stretch upstream of the river at Panzorconi near chapel the salinity measured is 1.18 ppt and further at the downstream of the river at inside NH17 Near Sand Excavation loading point on mud road it is 5.16 ppt.